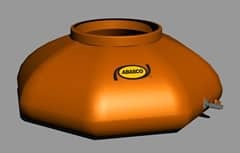 ABASCO spill berms are the perfect solution for spill containment or emergency drips. They can be used for secondary containment or as a decontamination/wash down the station. Spill Berms are easily transported and quickly set up, making them an excellent choice for remote or temporary sites and emergency situations. Kwik Tanks are manufactured using 22-oz or heavier PVC, Elvaloy, or urethane-coated fabric, depending on the application, and the frame is made of lightweight, aluminum tubing with aluminum fittings. The tanks can be erected by one person in 10 minutes or less. 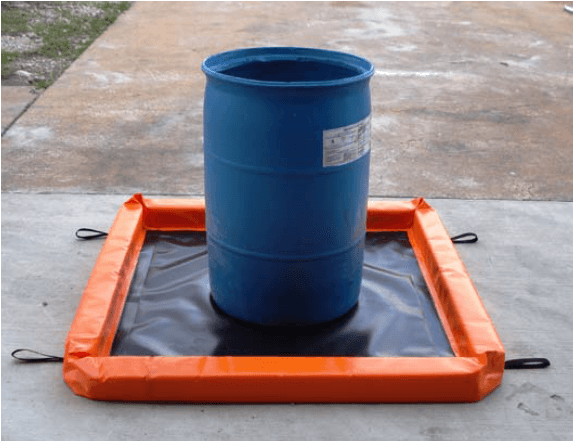 Kwik Pools are inflatable oil-containment units for use in emergency situations in plants, remote locations, or under overturned trucks or railcars. They are made of PVC, Elvaloy, urethane-coated fabrics, or can be custom-made to specification. Sizes vary from the KP-3, with 100-gallon (379 liter) capacity, to the KP-48, with 1,600-gallon (6,057 liter) capacity. Portable, self-erecting open top reservoir for temporary storage of all types of liquids. Used for spill recovery, industrial waste, potable water, fire fighting, civil construction, sewage and bulk storage of other liquids. Lightweight, easily portable and can be set up in minutes by one or two people. No frame is required. Floating collar rises automatically as the tank is filled. Includes standard storage/carry bag, groundsheet, and filling/drain connections, handles on outside of the tank, tie downs and anchor points. Options include a top cover, replaceable inner liner, and repair kit. Constructed of PVC or urethane-coated fabrics, depending on the application. Portable, field-erectable, open-top tanks for temporary storage of all types of liquids. Used for spill recovery, industrial waste, potable water, firefighting, civil construction, sewage, and other liquids. Fold into a compact package for easy transportation and storage. Lightweight, portable tanks can be set up in minutes by one or two people. No tools are required. Options include replaceable inner liner, repair kit, and fill/drain connections. Constructed of UV-resistant, hydrocarbon-resistant PVC-coated polyester fabric. The urethane-coated fabric is optional. Towable oil bags are specifically designed and manufactured for transportation of oil and related products. They are custom made of heavy-duty fabrics, ranging from PVC to urethane, depending on the application. They can be towed on water or used as storage units on land. 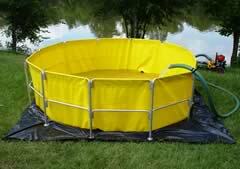 Sizes range from 500 to 2,500 gallons. Contact ABASCO for more information.